OPENING SALVO: Robert Dowd fires in GB's first period opener in Belfast. Picture: Dean Woolley. GREAT BRITAIN picked the perfect time to finally avoid final day disappointment at the World Championships - winning gold and promotion to the second tier with a 4-0 victory over Japan. Twice in as many years, Pete Russell’s team had entered the final day of a Division 1B tournament well-placed to take gold and move up to the second division of the world game. Twice they were denied. But in front of a passionate, boisterous home crowd at Belfast’s SSE Arena, the national side finally got their reward. Going into the game there was little to separate the two teams - at least in terms of world rankings and the Division 1B standings given both boasted 100 per cent records. But, over the course of the 60 minutes, the gulf between the two sides proved considerable. Spurred on, no doubt, by their previous final day woes, Russell’s energetic squad clearly were in no mood to let their hopes be dashed at the death once again. If nothing else, the shots on goal stats were a clear indicator of GB’s dominance, allowing Japan just two on Ben Bowns’s net compared to the 12 they created at the other end of the ice. 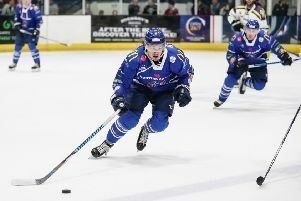 But despite their offensive strength, the hosts were made to wait for their opening and it required a 5-on-3 powerplay to break the deadlock when Sheffield Steelers’ Robert Dowd fired home at 17.42. Japan paid the penalty once again just over four minutes into the second period when Brendan Brooks tipped in a Dowd drive with the hosts on the man advantage. Japan had an effort ruled out shortly after for goalie interference on Rotherham-born Ben Bowns and it was to prove a crucial - and correct - call by the officials. Matthew Myers slots home GB's fourth goal in the second period against Japan. Picture: Dean Woolley. Just before the halfway mark, it was 3-0 when Matthew Myers was rewarded for providing a screen in front of Yutaka Fukufuji, tipping in from Colin Shields speculative shot from the blue line. It got even better for the hosts at 37.55 when a break by the impressive Evan Mosey saw him time a pass perfectly for the advancing Myers who rifled the puck home to make it 4-0. Japan rallied in the third period and showed more bite, but Bowns and the solid GB defence dealt with everything thrown at them, holding out for a second successive shutout, a gold medal and, most importantly, a first promotion since 1993 as the SSE Arena ice was left covered in the discarded helmets, gloves and sticks of the GB team as they took to the ice to celebrate wildly with each other. The puck nestles in the net after Brendan Brooks tips in a Rob Dowd shot. Picture: Dean Woolley.